Tonight, we'll be staying up late, to watch the results come in and blog them live as they happen. But right now the voting's just getting going, and we're in a hubristic frame of mind. So we decided to try to predict what parliamentary London is going to look like this time tomorrow morning. Just to confuse things, though, those dastardly fiends down at the Electoral Commission have changed most of the boundaries. This year we get an entirely new set of constituencies (73, down from 74). And to get round the fact that you can't really say who's the MP for a constituency that hasn't technically existed before, political types do some number crunching and work out the seat's "notional" majority - that is, who would have won it if it had actually existed five years ago. ...then you're pretty much stuck with your MP - or at least, with their party. That's not to say you shouldn't vote - voting, after all, is important, and you can never be sure that there won't be a rush of rampant conservatism in Hackney or Marxist-Leninism in Ruislip. 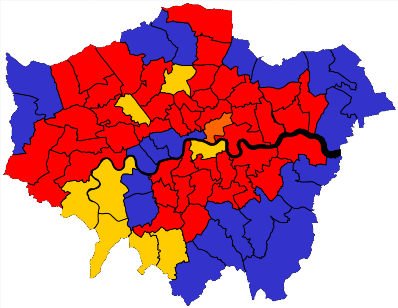 But, the odds are, if you're in a Labour seat on this map, you're getting a Labour MP tonight. For those who aren't familiar enough with the electoral map of London to spot the changes, here they are, in a nice little list. The party in brackets is the one that holds the seat at the moment. You may spot a theme. Labour might, however, get lucky in one constituency. Respect's George Galloway has abandoned Bethnal Green and Bow (14) to fight windmills further east in Poplar; this, it seems likely, will only split the lefty vote and hand the seat to the Conservatives. And without the party's most famous figurehead, Bethnal Green seems likely to revert to the red team. We also predict that Ed Fordham (not, as we previously stated, Sarah Teather) will hold the new Hampstead and Kilburn seat (15) for the LibDems, seeing off competition from Glenda Jackson, the Labour MP for the current Hampstead and Highgate seat. 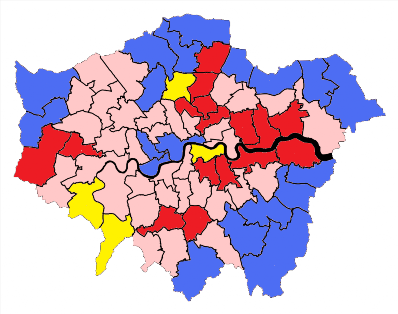 A couple of other anomalies: Enfield North (16) and Finchley & Golders Green (17) were Labour wins in 2005. But boundary changes have given both seats a notional Conservative majority. They thus seem likely to be a Tory "hold" this evening. The Tories actually did win Croydon Central (18) in 2005. There, though, boundary changes created a notional Labour majority. As a result, Labour look set to "lose" a seat they haven't held in five years. We are, almost certainly, somewhere between slightly and enormously off with that. We'll be staying up late tonight to find out, and reporting the results as they happen. Should you be up too, why not join us, and find out exactly how wrong we were?